Sorry, there are no shows on sale at Apollo Victoria right now. The Apollo Victoria Theatre has a heritage dating back to 1929 when it was opened as a state-of-the-art cinema, commissioned by Provincial Cinematograph Theatres (PCT) to accommodate the growing popularity of 'talking pictures'. The theatre was designed by the architect Ernest Walmsley Lewis along an Art Deco style that still remains to this day; upon its official opening in 1930, the Gaumont British News charmingly called the interior of the theatre 'a fairy cavern under the sea, or a mermaid's dream of heaven'. In the decades following the theatre, known as the New Victoria Cinema, was renowned as a place to watch film, variety and even big band performances within walking distance of bustling Victoria Station. Despite its cinematic origins, the building closed in 1975 and was reopened as the New Victoria Theatre, shifting its focus on to more musical content. A concert was scheduled to celebrate the new opening, with Shirley Bassey performing as a headline act! The theatre hosted a series of well-loved musicals in the late seventies and early eighties including Fiddler on the Roof, The Sound of Music and Camelot, before becoming the venue for the debut performances of Andrew Lloyd Webber's exciting new musical Starlight Express. The interior of the auditorium was completely redesigned for the production, with race tracks running through the audience and modifications to incorporate a split-level rollerskating rink. The rehaul proved to be entirely justified when Starlight Express went on to have huge success, playing at the theatre for an amazing 18 years before finally closing in 2002 to make way for another Lloyd Webber musical, the Bollywood-inspired Bombay Dreams. The A. H. Rahman production ran for two successful years before ending in 2004, after which it was followed by the classic Saturday Night Fever for a brief stint and then Movin' Out, the Billy Joel musical. This closed in February 2006 to allow for preparations for Wicked, which opened in September the same year to rapturous praise and overwhelming commercial success. The theatre is within walking distance of Victoria tube station, one of London's busiest stations with many connections. The station is accessible via the Victoria, District and Circle lines. Victoria station is a main hub for National Rail trains across the country. The theatre is within walking distance of the station. If you would like to drive to the theatre, there are various meters on the roads surrounding it, including on Allington Street, Bressenden Place and Carlisle Place. Victoria Bus station is next door to the rail station which is within walking distance. It is the arrival point for most big coaches in the country. Local city buses also travel to this station. The tariff for the meters on the roads is ú2.00 per hour, although it can get busy so you may want to avoid this option at certain times of the day. Alternatively London Victoria Car Park is a 6 minute walk and will cost ú22.00 to park for the day. There are 3 steps between rows in the auditorium. The wheelchair accessible entrance is via the Vauxhall Bridge Road entrance of the Theatre. A wheelchair lift provides level access to the Accessible Toilets and foyer facilities. Another wheelchair lift gives access to the wheelchair area in the circle. 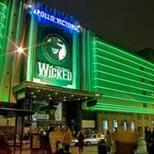 The Apollo Victoria Theatre has 4 wheelchair spaces available in the Circle seating area. They are on the two side blocks of seats, row F. To reserve a wheelchair space call the Apollo Victoria Theatre Box Office on 020 7828 7074. There is an induction loop along with an infra-red system within the auditorium. Guide dogs are allowed in the auditorium. All disabled patrons must book on 020 7828 7074. Any other questions please call 020 7834 6318.